Homemade egg sandwiches can be so much better. Picture your basic fast-food breakfast sandwich: There’s the flimsy approximation of an English muffin, the stiff egg disk, the American cheese and the too–salty sausage patty. Those not-so-great components can add up to satisfaction on the right hungover morning, but homemade egg sandwiches can be so much better. 1. Rethink the bread. Replace the muffin with a homemade biscuit made using F&W’s Mad Genius Tip for extra-flaky biscuits. 2. Don’t squander the yolk. Scrambled eggs are well and good, but the runny yolk of a perfectly fried egg is magic in a breakfast sandwich. 3. Change up your cheese. Use cheddar cheese instead of American cheese. It may not be as melt-able, but it’s much more flavorful. 4. Upgrade your pork. Instead of a sausage patty, top the sandwich with salty, deliciously meaty country ham. 5. Add jam. A touch of raspberry jams adds sweet complexity. 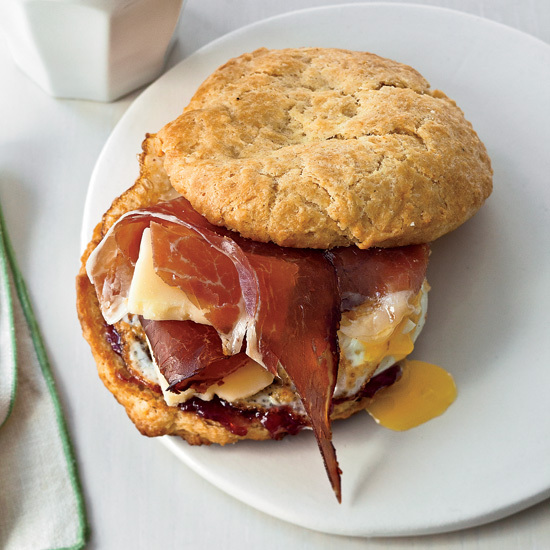 Get the recipe for the best-ever biscuit breakfast sandwich.